Taking on any kind of home improvement or do-it-yourself project can be quite the daunting task, especially when it involves doing some painting. If you’re a beginner taking on your first painting project, and want a paint sprayer that will help you get the job done easily and effectively, then the Finish Max from HomeRight might just be the best model for you. Take a look at this review to see all the amazing features it offers. First, let’s go over the basic components and elements of this paint sprayer, since this is what really helps establish it as an amazing paint sprayer for beginners. Right away, one of the biggest key features is that it is an airless paint sprayer, which makes it much easier for anyone to pick up and start using right away, as opposed to compressed air sprayers, which require a greater level of skill as well as an external air compressor. No beginners should have to deal with the hassle and potential danger of setting up an entire air compressor, so this is a major benefit for those who want to focus on painting over complicated setup. The Finish Max is a completely self-contained unit, which means that all you need to do is load the cup with paint and plug the unit into a standard wall outlet and you can start painting. That’s one of the best aspects of an airless spray painter like this, since you always have everything you need to get going and don’t need to trouble yourself with setting up a large base unit or being limited by a stationary compressor. Still, you will need to make sure you have proper access to outlets in your work area, as you aren’t able to attach any extension hoses to add extra reach. Many paint sprayers only work with certain types of paints, typically the most common types for residential painting. Others may also require you to thin the paint before using it, to allow it to properly pass through the sprayer. However, this model is made to be compatible with standard latex and acrylic paints, as well as specialty compounds such as for creating chalkboards or finishing cabinetry. Since this model is designed to be as easy to use as possible, you won’t have to worry about doing anything overly complicated to start painting. That simple setup is what also allows the Finish Max to create a smooth and even coating, as HomeRight has designed this unit to deliver a steady controlled flow of paint. You won’t need to adjust the pressure at any point, so you are going to be able to achieve a more uniform dispersal of paint on each passing. There’s also a three-stage control nozzle that allows you to spray in a horizontal line, vertical line, or with a circular stream. However, if you are trying to use it for a larger project like big exterior walls, or a detailing project such as staining intricate woodworking, you might run into a few hindrances. The spray pattern has a relatively low range, starting at 1 inch on the low end and only going up to 6 inches. This means that you may have issues with those fine details, and the larger projects might take you longer than you’d like. Still, this smaller range means you won’t have to worry about accidentally switching to a setting that creates a lot of overspray. As you might be able to guess, the cleanup with this model is going to be pretty straight forward, since there aren’t a ton of extra components or attachments that you have to worry about. The bulk of the action is going to involve removing the paint cup and thoroughly washing it to remove any leftover paint. In some cases, this might prove to be a little annoying, since certain types of paint may call for multiple washes with special solvents. On the plus side, the mouth of the cup is relatively wide, meaning you should be able to fit cleaning brushes inside comfortably. This model also comes with a cleaning brush included, which is a major benefit because you will also need to pay attention to the spray nozzle as well, if you want to keep your sprayer functioning at tip-top shape. 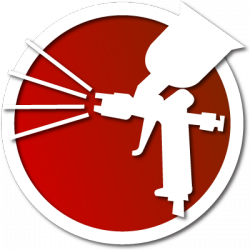 Cleaning the nozzle shouldn’t be too difficult, however, since HomeRight uses a brass spray needle, compared to some other models that use plastic or cheap, weak metals. For the best results make sure you follow the specific cleaning instructions based on the type of paint you use. The Best Beginner Paint Sprayer? All in all, there’s a lot about the Finish Max that makes it a fantastic beginner paint sprayer, most of which comes down to its straightforward and simple design. It might prove to be too basic for more complicated jobs or for seasoned painters, but it’s practically perfect for anyone who’s new to painting and wants to get up and running quickly.